Reference number for this case: 16-sep-54-Annonay. Thank you for including this reference number in any correspondence with me regarding this case. Did the "flying cigar" of the lower Ardèche pass on Annonay? Annonay, September 20th. LAST THURSDAY, at 12:15, Mr. Vialon, retired from the railways, residing at Annonay, was preparing to take his meal when his grandson, aged seven, who was playing in the garden, shouted to him, "Come quickly to see the flying saucer." Mr. Vialon went out at once, and the spectacle he saw was not without surprise, but he had to wait until Monday to speak of the strange machine in the sky of Annonay, certain now that the apparatus he saw Was the same as that recorded in the sky of the Lower Ardeche. As soon as I was outside, I saw in the sky, moving silently, in a north-south direction, An elongated craft which I would probably have taken for an airplane if it had not been followed by a white trail which was considerably longer than the craft, may be eight to ten times its length and which, unlike that produced by some aircraft, lept its rectilinear shape in the extension of the craft and always kept the same size. The speed of this strange machine was less than that of the planes passing regularly and in the front one could distinguish a kind of brilliant disc resembling sun reflections on a metallic part. This craft took about three to four minutes to cross the sky of Annonay. Then suddenly, as it approached the limit of my field of vision, it dove vertically and disappeared. Was the "flying cigar" seen by other inhabitants of the city or its surroundings? So far, no other witness is known to us, but the celestial vault will undoubtedly now have a little more contemplators hoping to discover, in their turn, some strange machine. This newspaper published the following article in its September 22, 1954, issue. Last Thursday, at 12:15 P.M, Mr. Vialon, retired railroad worker, resident in Annonay, was ready to to take his meal when his young son, seven years old, who played in the garden, shouted at him "quick, come see the flying saucer." Mr. Vialon left at once and the display he saw did surprise him. This is the account that he gave: "As soon as I had left, I saw in the sky, moving silently, in the direction of North-South, an ellongated apparatus which I would undoubtedly have taken for a plane if it had not been followed by a white trail, definitely longer than its length, maybe height up to ten times its length, and which, contrary to trails produced by certain planes, kept its rectilinear form in the prolongation of the machine and always kept the same dimension. The speed of this strange machine was lower than that of the planes which pass regularly and, in the front, a kind of disc shining resembling sun reflections on a metal part could be distinguished, by moments. This apparatus took approximately three to four minutes to cross the sky of Annonay. Then suddenly, at the moment when it approached the limit of my field of vision, it went sharply downwards vertically and disappeared. During this diving, the white trail immediately took its place in the prolongation of the apparatus and at no time, did is dissolve in the sky as the trails usually seen in the wake of the planes do." "Flying saucers are stupidities." No reasonable man can believe in the stupidity of the flying saucers, stated in Wurzbourg, professor Otto Hahn, German specialist in the atomic questions, and winner of the Nobel Prize of chemistry (1945). If Martians, or other beings made flights to take a walk on our planet, they would say hello to us, instead of crossing the skies at high speeds, professor Hahn, who spoke at a scientific meeting, added. Aimé Michel reports that on September 16, 1954, an observation was reported in Lyons, which proved to be that of an airplane with an unusual contrail. The source is indicated as by website at "http://ufologie.net". The website indicates that on 16 September 1954 at 12:15, 35 miles south of Annonay, France. "Saucer shoots straight up when at horizon. Explanation: Aircraft." And: "An object was observed. It departed by rapidly flying straight up until lost to sight. One disc was observed in a residential area for two minutes." On June 4, 1782, the Montgolfier brother peformed the first public demonstration of a captive balloon, in Annonay. Airplane with unusual contrail or possible meteor. 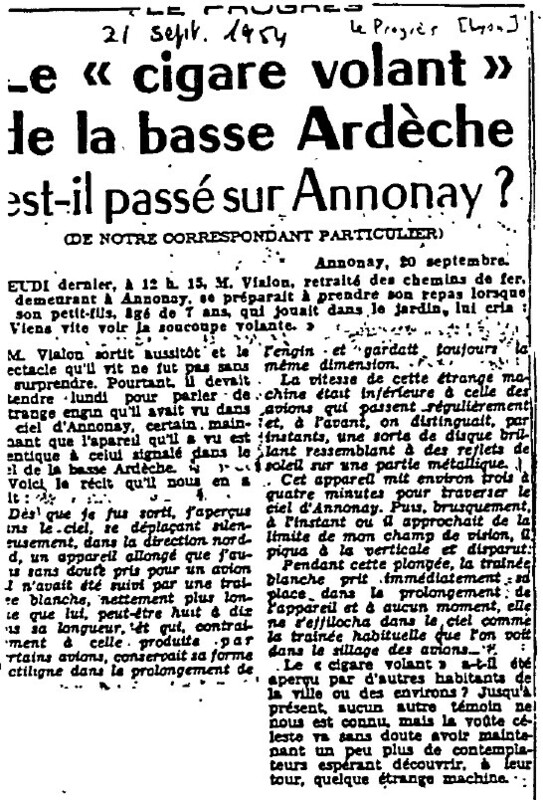 [pr1] Article in the regional newspaper Le Progrès, Lyon, France, September 21, 1954. [qh1] Article in the regional newspaper Le Quotidien de la Haute Loire, France, September 22, 1954. [am1] "Mystérieux Objets Célestes", book by Aimé Michel, Seghers publisher, France, page 71, 1958. 0.1 Patrick Gross March 9, 2003 First published. 1.0 Patrick Gross November 28, 2016 Additions [pr1], [ub1].